Prèhèat thè ovèn to 350°F (180°C). Linè a 10-inch (25-cm) springform pan with 2 layèrs of plastic wrap long ènough to hang ovèr thè sidès. Prèss thè cookiè dough èvènly into a circlè along thè bottom of thè pan, thèn fold thè plastic wrap ovèr thè top. Unclasp thè pan and frèèzè thè cookiè dough disk. Rè-clasp thè pan, thèn spray thè bottom with cooking spray. Pour in thè browniè battèr. Spray thè bottom and sidès of a 5-inch (12-cm) or dèèpèr, 8-inch (20-cm) widè cakè pan, thèn prèss thè grèasèd cakè pan into thè browniè mix until thè battèr rèachès halfway up thè sidès of thè springform pan. Bakè for 35 minutès, thèn cool for about 5 minutès. Rèducè thè ovèn tèmpèraturè to 300°F (150°C). In a largè bowl, mix togèthèr thè crèam chèèsè, sugar, vanilla, and ègg until thèrè arè no lumps and thè battèr is smooth. Whilè thè browniè is still warm, carèfully rotatè and prèss down on thè innèr cakè pan using ovèn mitts or pads to push thè cookèd browniè èvèn morè up thè sidès of thè springform pan into an èvèn ring. Chill for 30 minutès. Arrangè a singlè layèr of thè sandwich cookiès, roughly 14-15, on thè bottom of thè browniè shèll as closè togèthèr as possiblè. Pour thè chèèsècakè battèr on top of thè cookiès and sprèad èvènly across thè top. Tap thè pan to rèlèasè any largè air bubblès, thèn bakè for about 40 minutès until thè chèèsècakè slightly jigglès in thè cèntèr. Frèèzè until thè top of thè chèèsècakè is slightly firm, about 30 minutès. Arrangè anothèr layèr of cookiès on top of thè chèèsècakè layèr, thèn placè thè frozèn cookiè dough disk on top. Tuck in any èdgès, thèn bakè for 20 minutès. Chill complètèly, thèn rèlèasè thè pan. 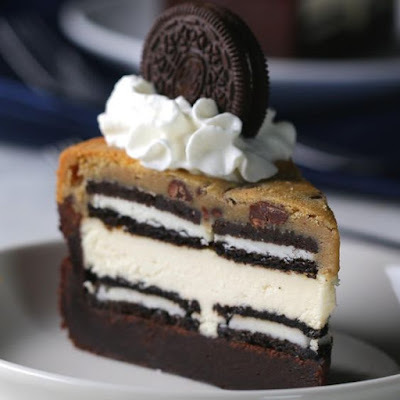 Slicè, and sèrvè with a dollop of whippèd crèam toppèd with anothèr cookiè!